Tons Of Weather Apps Available In Google Play Store(Free And Paid). But Unfortunately Only A Few Of Them Really Worth And Provide You Accurate Weather Report Of Your Current Location Or Other Locations. This App Has Dozens Of Features And Provides You Accurate Weather Report Of Your Area. You Can Easily Check Hourly Weather Updates, 14 Day Weather Forecast Of Your Area Or Other Locations. Two Types Of Themes Are Available – Light And Dark. Themes Are Set On Automatic Mode. Dark Theme Will Automatically Turn On After Evening. With On-Going Notification Feature You Can Check Temperature Of Your Current Location From Your Notification Bar. If You Don’t Like It, You Can Turn Off It From Settings. Map View(Satellite Or Traffic) – You Can View Weather Report On Map Also. Map Layers Which Provide Additional Information Are Also Featured In This App Like – Humidity, Dew Point, Local Temperature Etc. There Are 3 Awesome Widgets Which You Can Display On Home Screen. You Can Adjust Transparency Level Also. Pros – Accurate Information, Map View, Widgets, And Other Features. Cons – Large Size – 52 MB, Free Version Contains Ads, You Need To Pay Almost $10 To Purchase Pro Version. It Is A Stylish App With Many Features. You Can Easily Know Your Current Location Weather Report – Hourly, Daily. Weather Report Includes This Information – Clean Or Cloudy Or Rainy, Temperature, Wind, Humidity, UV/Index, Sun Rise-Sun Set Etc. With On Going Notification You Can Easily Check Current Temperature Or Weather Status Of Your Location. Customizable – You Can Change Background Of The App With Various Wallpapers. There Are 6 Types Of Widgets And Two Types Of Weather Icons Available That Can Be Display On Home Screen With Transparent Look. It Is Another Popular Weather App For Android By Yahoo!. You Will Get A Complete Weather Report Of Your Current Location On 1 Page. Yahoo Weather App Comes With A Clean UI Which Suit Users Preference. Features Of This App Are Amazing – You Can Set Daily Weather Notification To Get Forecast Every Morning And Evening. The Weather Report Includes These Details – Clear Or Cloudy Or Rainy, Temperature, Hourly And Daily Updates, Visibility, Humidity, And More. You Can Set Daily Cellular Data Limits Also i.e. 10 MB, 20 MB. After The Limit Exceed, App Will Notify You Or Disable It Self. With On Going Notification Users Can View Temperature Or Other Weather Information From Notification Bar. There Are 7 Widgets Comes With This App To Display On Home Screen Of Android. Cons – Ads(But Not Too Annoying). It Is A Simple App With No Extra Features But You Can Try. Almost All Features That Mentioned In Above Apps Are Featured In This App. Hourly, Daily Weather Reports Of Current Location. 10 Or 14 Day Forecast. Map View, Weather Report Includes These Details – Wind Strength, Direction, UV/Index, Sunshine-Sunset, World Clock, Humidity, Temperature, Air Pressure Etc. With Over 50 Million Downloads On Google Play Store, 4.4 Rating, AccuWeather Is The Most Popular Weather App For Android. This App Offers Many Useful Features i.e. Android Wear Support, Prepare My Day Feature Notify You When To Take Jacket Or Umbrella. Easily Know Current Weather Condition Of Your Current Location Or Of A Specific Location With This Weather App. Weather Report Include These Details – Clear Or Cloudy Or Rainy, Temperature, Hourly Or Daily Weather Updates, On-Going Notification Etc. There Are 4 Beautiful Widgets Comes With This App – Dark Theme Weather Widget, Light Theme Weather Widget, Custom Weather Widget, 1*1 Weather Widget. This Is Another Popular Weather App For Android And Has Many Awesome Features Which Is Not Available In Other Apps. However, These Additional Features Are Useless For Many Of You. This App Comes With Free And Premium Versions. Free Version Has A Limited Access To Features And Contains Ads. To Access All Features You Need To Pay. This App Supports Android Wear. Features – Raindrop Effects(Raindrops Falling Down Your Screen When It Rains). Many Beautiful Widgets And Live Wallpaper Are Available To Use But You Need To Install Them Separately From Google Play Store. Pros – Weather Report With All Type Of Details, Many Customizable Features, Map View, Android Wear Support, 6 Widgets Etc. Cons – Unnecessary Features, Ads, Limited Access(Free Version). You Can Use Google Weather App Also To Check Hourly, Daily, And 10 Day Weather Forecast. With Google Weather App – You Can Check Temperature, Precipitation Also. You Can Change Unit From Celsius To Fahrenheit. Know Other Details – High Temperature Or Low Temperature Of The Day, Sunshine & Sunset, Wind Speed, Direction, Humidity, Dew Point, Pressure, Visibility, UV/Index. To Add Google Weather App To Your Home Screen, Go To Google App >> Search For “Weather” >> Then Tap On “Add”. That’s It. Pros – Very Accurate Information, No Ads, Easy To Access, No Need To Install App, Clean UI, Beautiful Themes. Google New And Weather App’s Main Function Is To Provide User’s Interest Based News And Local Weather Details. Second Tab Of This App “Local” Show You Current Weather Details Of Your Location. You Can Know 5 Day Forecast, Check Temperature By Time, Hourly Or Daily Weather Updates, Other Details – Sunrise, Sunset, Wind, Precipitation, Humidity. One Of The Simplest Way To Check Weather. It Is A Beautiful And Simple To Use App That Provides Accurate Local Weather Forecasts. You Can Know Air Quality, UV/index Of Your Current Location Also. This Weather App Comes With A Great Clean UI, Widget That Display Weather Forecast On Your Home Screen. Design Of This App Is Very Beautiful. You Will Get Useful Information Also Like Sunrise, Sunset, Full Moon Night Information, Temperature, Humidity, Visibility, Dew Point, Air Pressure, Wind Speed And Direction. Other Features – Alert Severe Weather, Rain Alarm. Price – Free(Contains Ads), Size – Only 11 MB. Pros – Provides Useful Information, Widgets, And Accurate Forecasts. This Is One Of The Best Light Size Weather App For Android On Google Play Store. Size Of This App Is Just 3 MB, But Features Are Amazing. You Can Access Weather Details Offline – No Internet Required!!! – The App Offers Optional Offline Access For Up To 24 Hours From The Last Time The Weather Was Updated. It Is An Amazing Feature. More Features – Weather Map, Current Weather Conditions, Forecasts(Hourly, Daily, Weekly, 10 Day, 15 Day), Track And Read Detailed Weather Information From Multiple Locations Around The World. Customize Your Data Usage – Option To Choose Update Weather Information On Mobile Data Or On Wi-Fi, Set The App To Only Refresh Manually. Weather Widget For Quick-View Of Weather Conditions On Home Screen, Weather Clock And More Features Are Available In This Small Weather App. Pros – All Features, Cons – No Cons. Price – Free(Contains Ads), Size – 3.26 MB. Download >> Here. It Is A Paid App With A Price Tag Of Almost $1. This Simple, Colorful, Elegant Weather App Comes With A Clean Design. You Can Set Custom Color For Theme, Timeline Forecast So You Can Easily Glance At The Information, Local Weather Alerts, Multiple Weather Provider Choices, View Weather Conditions On Graphs And Charts. This Weather App Support Android Wear Also. Get Most Accurate Weather Reports And Details Like Temperature, Wind Speed, Rain Forecast, Visibility, Humidity, Dew Point, Hourly Updates, Next 7 Day Forecasts Etc. Main Reason To Install This App Is “Widgets”. It Has Beautiful Widgets To Show Weather For The Day And Week. Price – Around $1, Size – 12 MB. This Is The Most Attractive, Beautiful Weather App On Google Play Store With Over 10 Million Downloads And 4.5 Rating. Know Your Current Weather Condition With Most Accurate Results, Forecasts, Precipitation. Features – Map View, Weather Layers, Track Sunrise And Sunset Time, Moon Phases, Notification Or Alerts, Graphs, Wind Speed, Visibility, Widgets, And Android Wear Support. Price – Free(Contains Ads, In-App Purchase), Size – Only 11 MB, Pros – Cool And Useful Features, Cons – No Cons. Download >> Here. The App Is Offered By Microsoft Corporation And Has Dozens Of Features. It Is Also A Light Size App. The Size Of This App Is Just 6 MB. Features – Know Latest Weather Conditions, 5-Day, And 10-Day Forecasts, Interactive Maps – Get More Detail With Temperature, Radar Observation, Radar Forecast, Precipitation, Cloud, And Satellite Maps. Other Features – Severe Weather Alerts, Automatically Sync Your Favorite Cities Across MSN Weather On The Web And Mobile Apps. Price – Free, Size – 6 MB. Cons – Widgets Are Not Too Impressive, Lacks Details, Ads. Download >> Here. It Is Another Popular Weather App With Over 5 Million Downloads On Google Play Store And 4.6 Rating. Features – Get Hourly, Daily Forecasts At A Glance, Weather Report With Information Like Temperature, Feels Like, Humidity, Dew Point, Visibility Etc., Status Notification, Map View, Two Themes – Light And Dark, Customizable Widgets, Monitor Air Quality, UV Risk, And Alerts. Pros – Excellent Or Accurate Forecasts With Great Info, And Widgets. Cons – No Cons. This Is A New App With Great Look And Displays A Good And Accurate Range Of Info About The Weather. 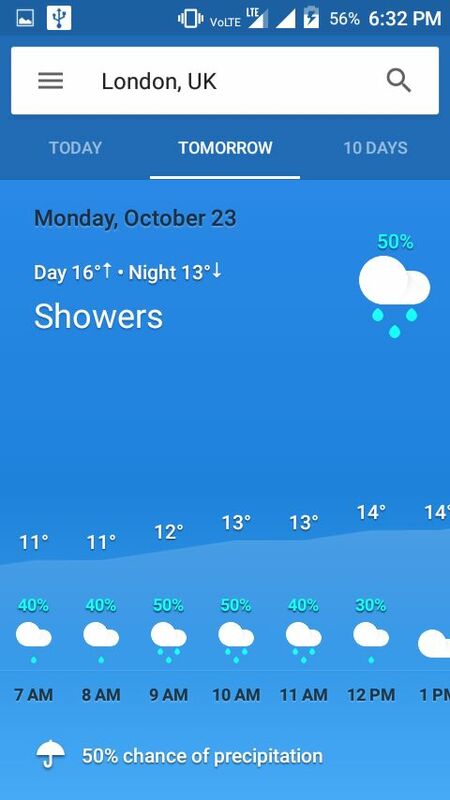 This App Helps You To Know Latest Real-Time Weather Condition, 10 Day Forecast, Transparent Weather Widget With Customization Option. Other Features – Local Weather Radar To View The Weather Condition On A Satellite Map. Filters – Clouds, Temperature, Precipitation, Wind, And Sea Level Pressure. You Should Try This Weather App. Price – Free, Contains Ads. Size – Just 14 MB. Download >> Here. This App Has Dozens Of Features And Has Over 10 Million Downloads. It Is A Quite Popular App In Weather Category. You Can Easily Know Current Weather Conditions Of Your Location And Other Locations, Check 7 Day Forecast. Features – Weather Radar & Rain Maps, Visual Widget, Sunrise-Sunset Time, Stylish Design, Deep Weather Details, On-Going Notification, An Excellent UI, Great Info, And More!! This Is The Last App Of This List, It Has Over 10 Million Downloads And Rated 4.4 On Google Play Store. Features Like On-Going Notification, Know The Weather Anytime, This Weather App Support “Android TV” Also, Add Location To Know Instant Details, Widgets For Different Locations, Support For The Lock Screen Widget In Android 4.2, And More!! Features Make This App Wonderful. Informative, And Best – The Current Weather Is Depicted With Amazing Real Life Graphics Of The Sun, Moon, Rain With Clouds, And Musch More. Simple And Beautiful Widget Also Available To Display On Home Screen. Light Size – Oly 8 MB, Price – Free, Contains Ads, In-App Purchase. Download >> Here. If You Need A Simple App Without Widget Then Try Google Weather App, I Recommend You To Use The Weather Channel App Because It Is Light In Size, And Provides Many Features. However, Choice Is Yours. Have You Any Suggestions For Readers? Submit Here, Like Our Facebook Page – MrGuider, Follow Us On Twitter – @techhuntr, Subscribe Us Via Email. Previous Post:Working UFO Is A New Android Game Released By Hal Laboratory, Creators Of Super Smash Bros.